Datalogic PowerScan PM8500 Complete Kit - Includes everything you need: PM8500 terminal (910 MHz, Display with REM Battery), charging / communications cradle, RS-232 serial interface cable and US power supply. 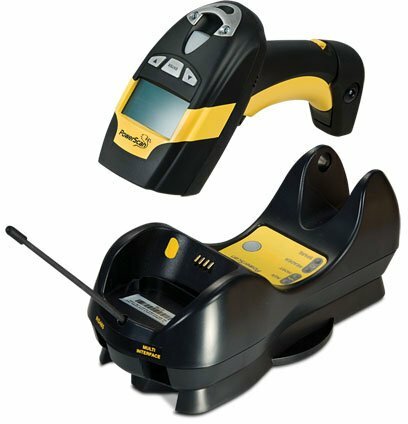 The Datalogic PowerScan PM8500 cordless area imager offers omnidirectional reading of 1D and 2D codes combined with unlimited mobility guaranteed by the Datalogic STAR Cordless System. The PowerScan PM8500 reader's feature a high-resolution Megapixel imaging sensor that is capable of outstanding performance in industrial applications. It is offered in three optic models: Standard Range and High Density models are for typical barcode reading conditions (for medium and high-resolution codes respectively), the Wide Angle model offers a wider field of view allowing the capture of larger and longer codes. PowerScan PM8500 Series USB Starter Kit. Includes everything you need to run your PM8500: charging/communications cradle, USB cable and US power supply. The Datalogic PM8500-D910RB-RS232-KIT is also known as Data Logic	PM8500-D910RB-RS232-KIT	or PM8500D910RBRS232KIT	.